The Nairobi Safari Club is the only hotel in Nairobi that offers just suite accommodations. There’s indeed a club atmosphere to the place. 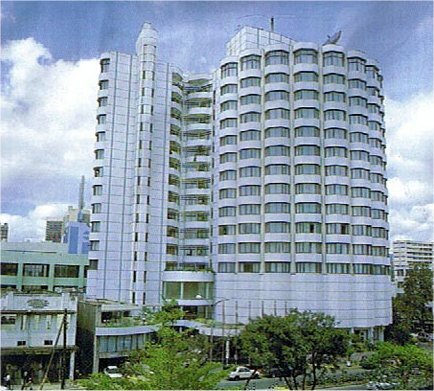 The extra space and professional amenities make this hotel a fine choice for business as well as holiday visits to Kenya. It’s known for it’s good service, but it isn’t the cheapest quality hotel in Nairobi with rooms starting at US$ 250 a night (including breakfast). There are 3 suite choices available: presidential, panorama and executive. Each one is a suite, meaning there is a bedroom and a separate lounge or living room, as well as a private ensuite bathroom. All of the suites have 3 telephones with voicemail and direct dialing service, satellite television, and a personal safe. All of the executive suites have balconies, and the presidential ones have jacuzzi tubs and 2 writing desks. There are a total of 146 suites at the hotel. The main Safari Restaurant serves up many dishes of international flavour, as well as some of the local cuisine specialties. Each day of the week offers up a different menu theme, such as Italian, Asian or Swahili. For a more casual environment, have a drink or snack at the Safari Terrace Bar. Cocktails are served all through the day, or you can relax listening to some live piano music most evenings. There is also a spot by the pool for grabbing a bite to eat while you swim. On the weekends, they have a special BBQ for grilled dishes. If you spend your day adventuring around Kenya, you might miss the typical meal times at the restaurants. So take advantage of the 24-hour room service to get your meals when you want them. There is a fully-equipped health and fitness center in the hotel, free to all hotel guests. There is a gym with fitness equipment, along with a swimming pool, sauna and massage services. For business travelers, there are computers, printers, photocopiers and fax machines available for your needs. Even half-way around the world, you can continue to operate business as usual. There are also 7 conference or banquet rooms to house any meetings or events. The Nairobi Safari Club is on University Way, which puts it right within walking distance of the city center. It's in a very busy neighborhood, which would suit folks who like some nightlife but could be loud for family travelers. The biggest and best attraction in all of Nairobi is the Nairobi National Park, and this famous safari park is about half an hour away. All the other sites in Nairobi are just a short taxi or matutu ride away: the National Museum, the Karen Blixen Museum, and the Watatu art gallery. Many local city or safari tours can be arranged through the hotel. So if you are looking for a bit of extra space with your accomodations, the Nairobi Safari Club is a good option. For more information or a quotation, check this hotel at Africapoint. This friendly and patient Nairobi-based travel agency knows all hotels in Nairobi and can tell you personally whether it's this hotel that suits you best, or another Nairobi hotel. Their rates are often very competitive.